Normally, a watch reviewed by us, stays for about a week or so. After that week, we pack its bags, call an Uber and send it back to where it came from. With the DBF001-02 this was a little different. 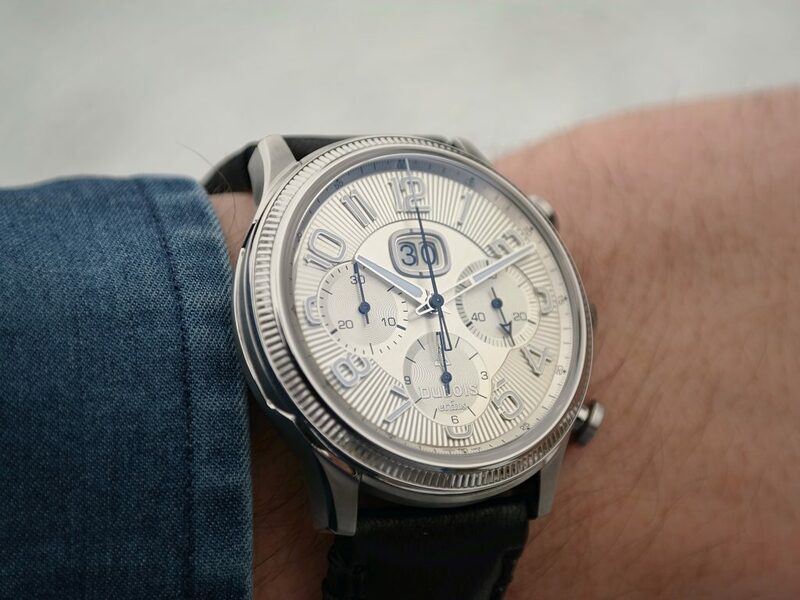 DuBois et Fils gave us time, so much time that falling in love with this watch was unavoidable. Chances are, that when you wear a DuBois et Fils watch, only a handful of people in the room will know what you’re wearing. 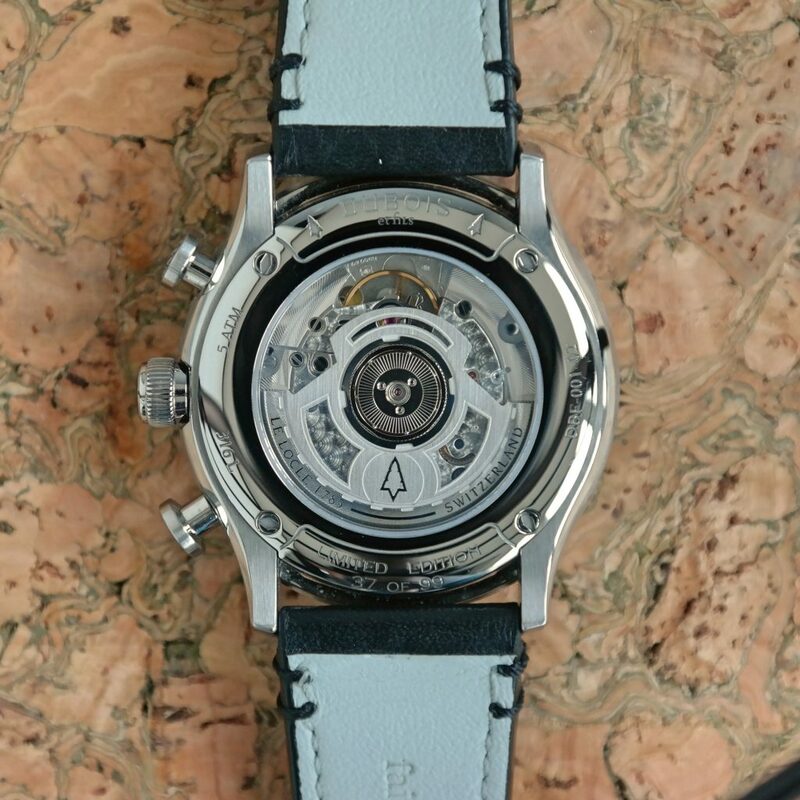 However, if you ask the rest to take a closer look – provided that they share a fair amount of watch knowledge – they’ll undoubtedly see that this is a very cool and good timepiece. The details in this watch are very appealing and well-balanced. The little screws that carry the brand’s logo, the case that’s visibly build out of different segments and above all, the guilloche dial with applied numerals that looks like it’s build out of sunrays leading your eyes across the dial. These aspects share the same (high) amount of quality and balance. In my opinion the proportions of this chronograph are perfectly executed. The DBF001-02 isn’t for everyone. Only 99 pieces will be made, meaning you are indeed very special with this limited watch. What appeals me a lot is the fact that this watch is a very distinguished chronograph, without being too sporty. The ETA 2892 movement is equipped with a big date chrono module made by DuBois Dépraz in La Vallée de Joux. A well-known and highly respected name when it comes to chronograph modules. 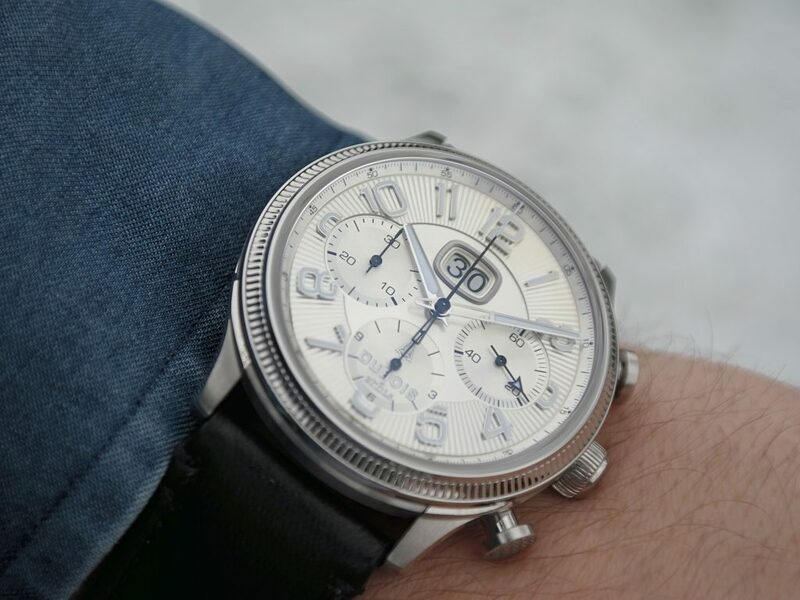 The dial has a silver-coloured guilloche finish which makes this specific chronograph very stylish. As said before, it’s much more a dress watch than the sport watch most of the chronographs are. I’m very attracted by the guilloche dial in combination with the Rhodium plated Arabic numerals. Each detail has been thought through and this results in perfect proportions for the counters, guilloche pattern as well as the numerals. 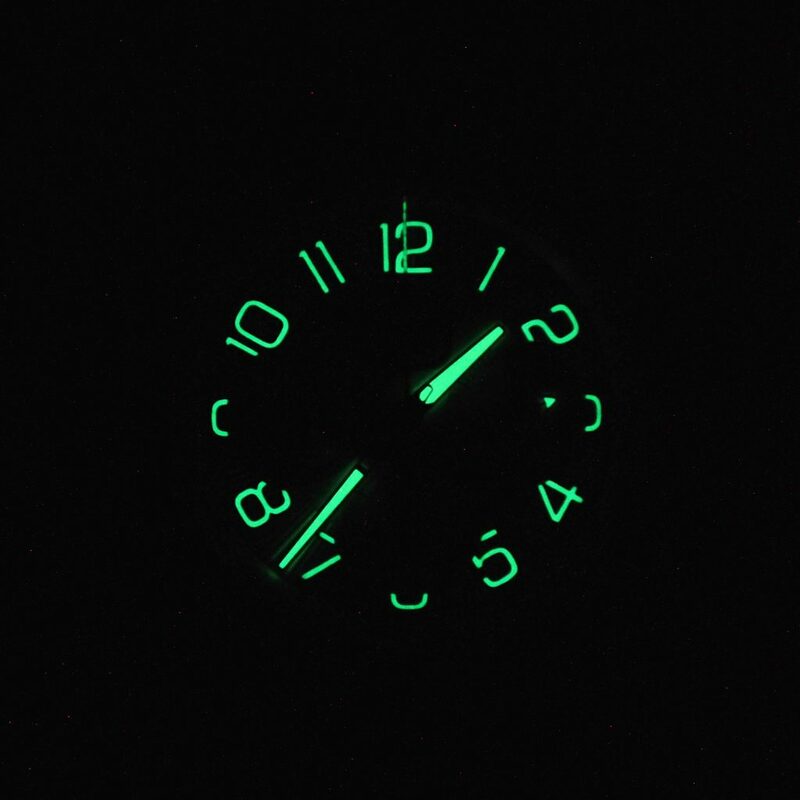 Another cool feature is the fact that the numerals are filled with SLNC1 lume. As a result, they seem white at daytime, but shine very bright during night-time. The T-pushers with a nice ‘zig-zag’ pattern look very sharp. However, I do find them a tad bit fragile due to their design. I’m wondering if this could result in a few problems here and there. 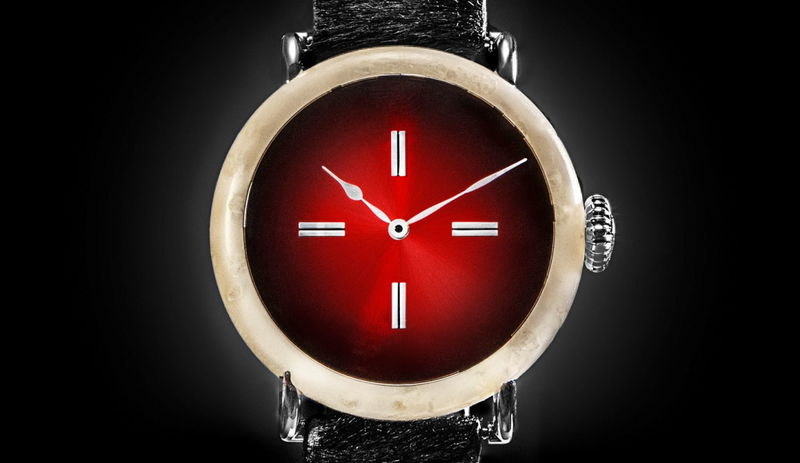 The last aspect that shows this timepiece is perfectly balanced is the big date. Most of the timepieces nowadays use a standard date-ring, resulting in strange placement or proportions. The DBF001-02 does think about this and to the eye, the big date window fits perfectly amongst other details on the dial. Honestly, we have now arrived at the part of the review that tells you some technical data. Besides that, I would tell you how awesome this watch is or how unbelievably crappy it is (which it isn’t by the way), but I feel the need to tell you guys a bit more about owning a DuBois et Fils. 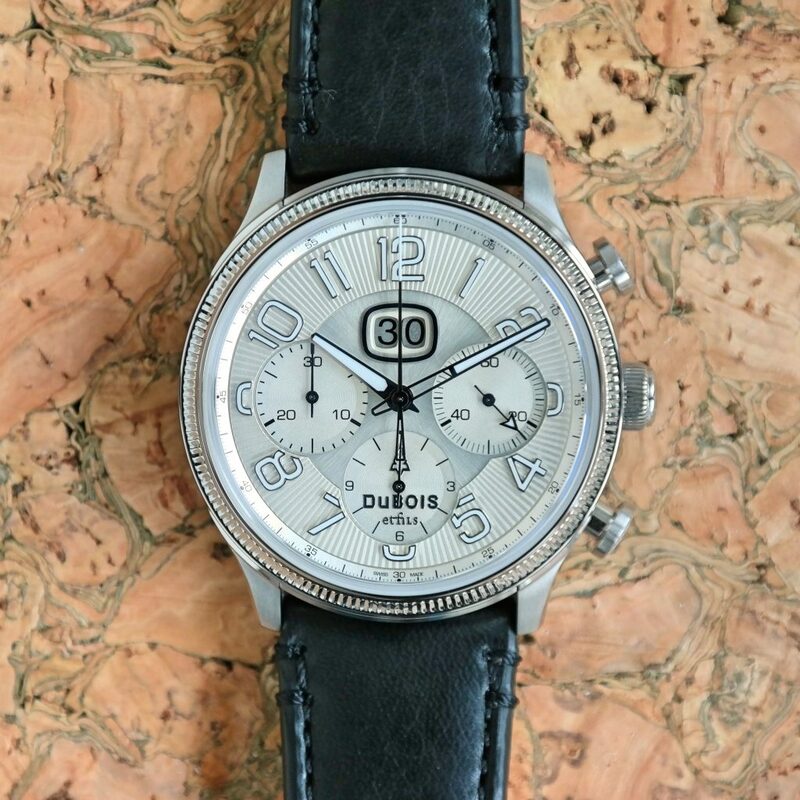 If you’re ever lucky enough to cross paths with another owner of a DuBois timepiece, I assure you there’s an immediate connection. Like, stepping inside that person’s home and instantly connecting to his WIFI network, because you know each other that well. No seriously, that’s the feeling the brand wants to create. Of course, not the WIFI story, but connecting with each other. Creating a bond between people that are in search for the perfect watch story or becoming part of one. It is those things that DuBois wants to achieve with giving the ability to rent a watch and share your moments with the rest of their community. Becoming a piece of the puzzle that is the oldest Swiss watch brand roaming this planet. Because DuBois et Fils wearers are looking for these aspects, there will be the ability to connect with DuBois et Fils wearers across the globe very very soon. So, if you ever need to be on the other side of the planet for business or just for fun, keep in mind that there could be a like-minded DuBois individual right around the corner. How exciting is that? Spice things up a little. So well yeah, I can’t deny it. 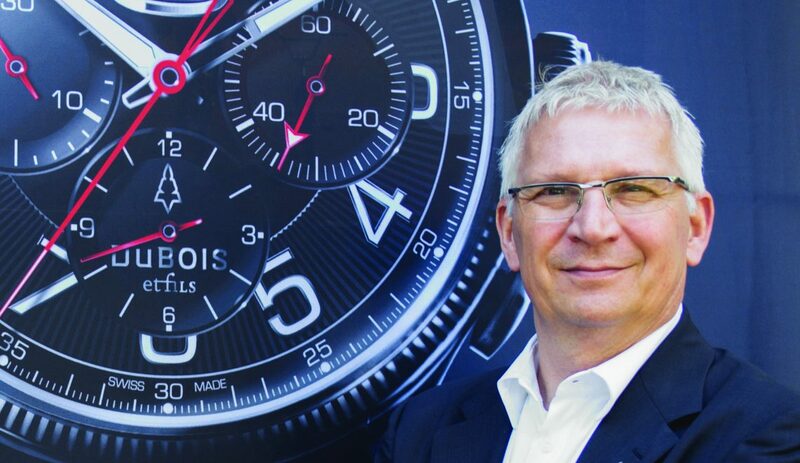 If you buy a DuBois et Fils watch, you actually DO become part of a story and a family. It’s not only marketing, no it’s reality. To be honest, I like realities like this one. They are what make us smile in an industry full of sheep. 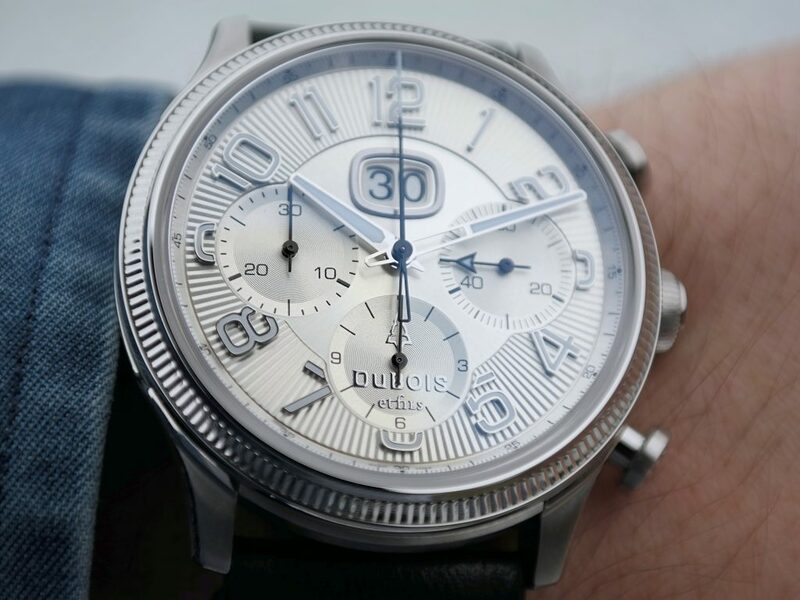 The DuBois et Fils DBF001-02 is a very cool chronograph. 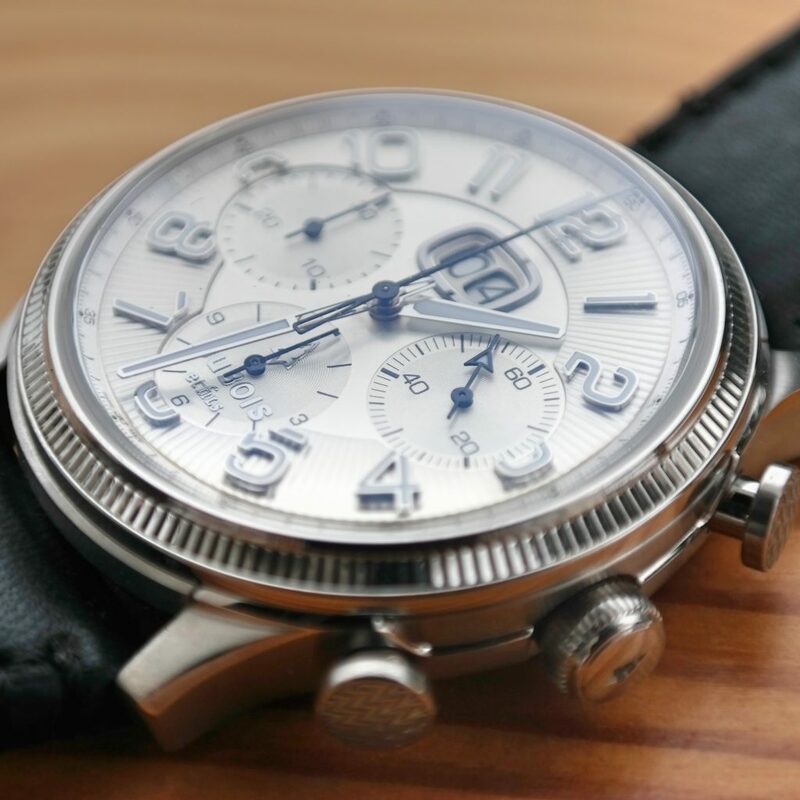 The fact that the huge amount of details together create a chronograph that looks very classy and luxurious, rather than sporty and purely functional, makes me adore it. I can’t stress it enough: this watch is really well-balanced and that’s something I find very important in the road to create a perfect timepiece.